The twenty-first century has ushered in a new age of data science and analytics. “Data science” as a scientific term was initially proposed about 15 years ago, and has since increasingly attracted attention and debate within statistics, analytics, computing, social science, and other scientific domains and disciplines. Although arguments have emerged from different communities such as, “How and why is data science different from statistics?” and “Why do we need data science when for decades we have had information science?”, it is undoubtedly a fact that data science is driving a new era of data-driven thinking, research, practice and education which goes far beyond the breadth and depth of previous efforts. In this data-intensive universe, data is a critical asset, and data science is the interdisciplinary core that drives new research, education and economy in many diverse areas. Although different definitions and interpretations exist, data science, as a scientific field, develops relevant methodologies, theories, technologies and applications for data, ranging from data capture, creation, representation, storage, search, sharing, privacy, security, modeling, analysis, learning, presentation and visualization, to integration across heterogeneous, interdependent complex resources for real-time decision-making, collaboration, value creation, and decision-support. The field encompasses the larger areas of statistics, data analytics, machine learning, big data management, and other disciplines, including complex systems, communications, social science, decision science, and management science. Data analytics and science has emerged as an important paradigm for driving the new economy and domains such as the Internet of Things, social and mobile networks, and cloud computing, and reforming classic disciplines such as telecommunications, biology, health and social science, as well as upgrading core business and economic activity. Data-driven scientific discovery, innovation and practice have become essential for gleaning understanding from large data sets and converting data into actionable intelligence, whether it is data available to enterprises and governments, or on the Web. In recent years, various initiatives have been created by government, business and professional organizations to promote the development of big data, data science and analytics, such as the provision of funding support from national science foundations for big data research, the IEEE Task Force on Data Science and Advanced Analytics, the IEEE Conference on Data Science and Advanced Analytics, and new courses on data science and analytics. The Journal of Data Science and Analytics (JDSA) was launched to specifically strengthen scientific innovation and practical development in this new era of data and analytics. JDSA aims to be a prestigious publishing venue in the data science and analytics field for the exchange of new theoretical and experimental designs, solid findings and insights, best practices and applications to real-life situations, and reviews of new opportunities and frameworks for data science and analytics. JDSA is the ideal venue for synergizing important innovations, major impacts, and significant contributions in data science and advanced analytics from diverse domains and disciplines for the advancement of interpretation, management, and usage of data intelligence. 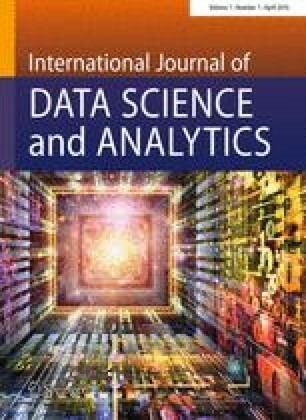 As the first scientific journal dedicated to data science and analytics science, JDSA will publish original, fundamental and applied research outcomes in data and analytics theories, technologies and applications, and will promote new scientific and technological approaches to strategic value creation in data-rich applications. Topics of relevance will include all aspects of the scientific foundations, techniques, and applications of data and analytics, especially new statistical and mathematical theories and techniques, data characteristics and complexity understanding, as well as theories on, and means to achieve, the synthesis and meta-synthesis of ubiquitous intelligence, including data intelligence, domain intelligence, business intelligence, organizational intelligence, social intelligence, behaviour intelligence, human intelligence, and network intelligence. JDSA particularly welcomes comprehensive surveys and reviews of all aspects of data science and analytics, together with position papers on the trends and controversies within data science and analytics science. In the evolution of data science and analytics, JDSA will be a core contributor and enabler.